Hope you are having a lovely fall! I’ve been teaching a lot of quilting on the BERNINA Q Series quite a bit over the past couple of months and I usually bring a trunk show along with me. 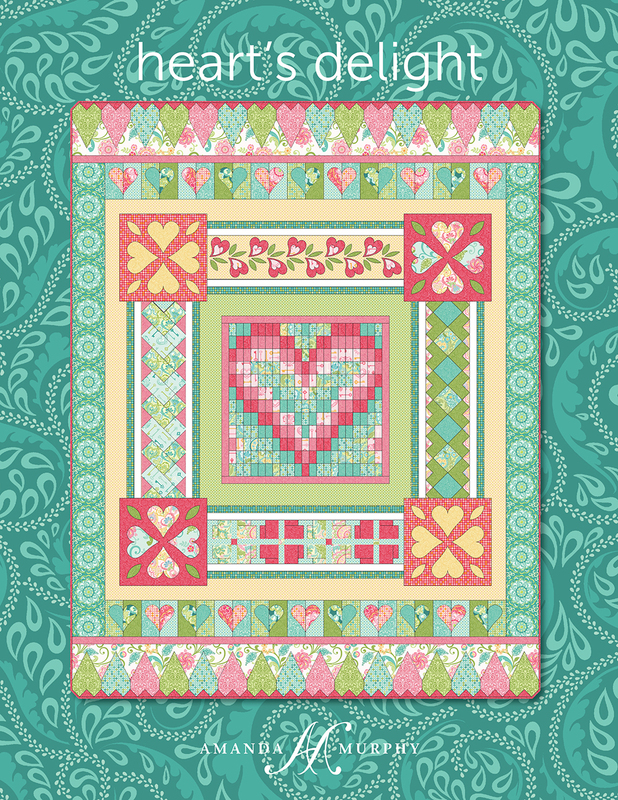 One of the questions I get asked most is how I chose the different quilting motifs on Heart’s Delight, my block of the month for Carina. So I thought I’d take a minute to tell you more about the process. I do usually start out with a general quilting plan, but I frequently change things alone the way. So, I knew that I, in this case, I wanted to use paisleys and petals and soft shapes, but contrast them with straight quilting lines as well. Just like the piecing really. The first thing I decided was the thread color. 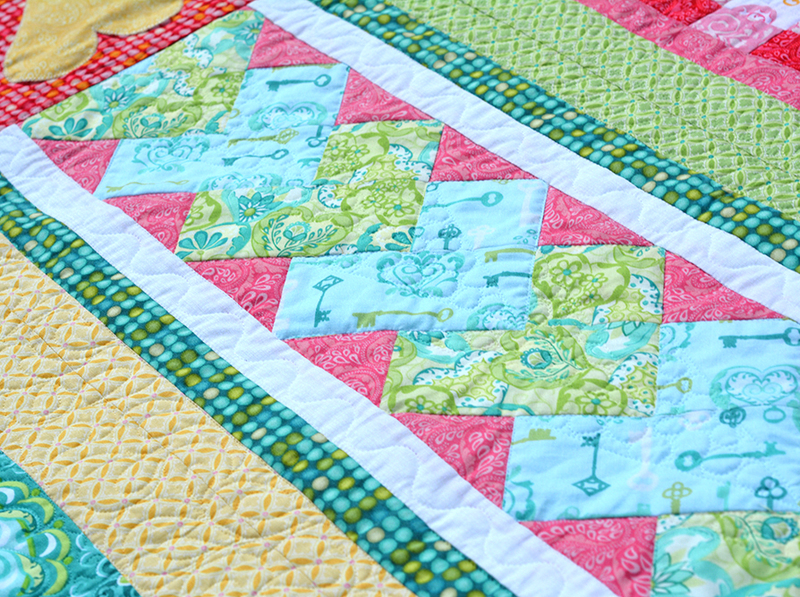 I like quilting with Aurifil 50 wt. cotton but time was of the essence (after all, it was less than a week until Market) so I opted for Aurifil monofilament in the top and Aurifil 50 wt. in the bobbin so that I wouldn’t have to change out colors. 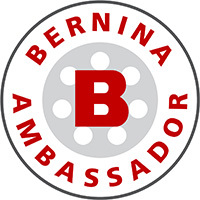 I have a large spool of the monofilament that I use both on my BERNINA Q24 and on my 780. When I use it on the 780 I like to use a thread stand to let it unwind, but it works well on both machines. I really love the Aurifil monofilament – it is soft and pliable and not shiny at all – it just sinks into the design. 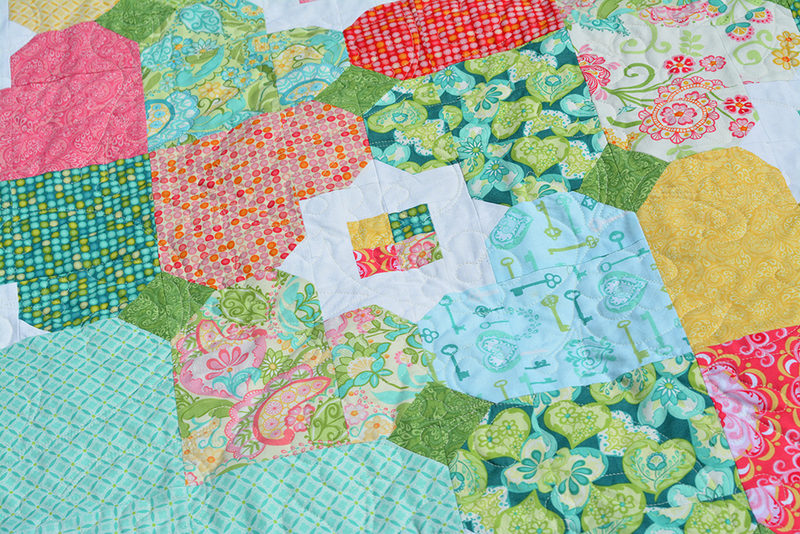 I started out by stitching in the ditch around all the blocks and elements on my first pass. I stitched in the ditch and added some of the larger fills as I worked down the quilt, but I only added the smaller fills once that process was completed. 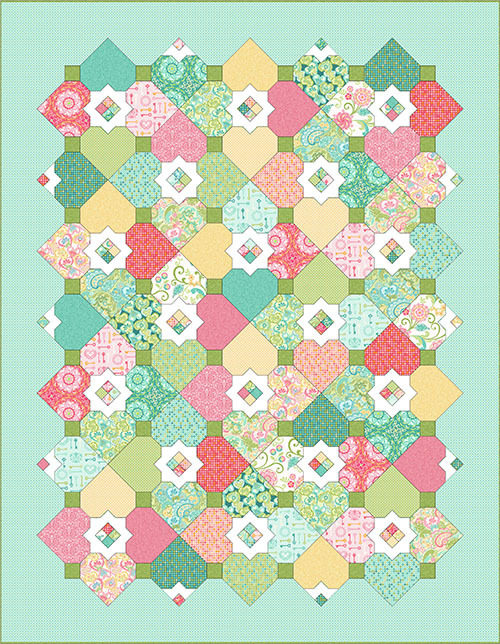 (For more information on fills see my Free-Motion Quilting Idea Book.) If I had been quilting on a domestic machine, I would have chosen to stitch in the ditch between all the blocks and around the appliqué motifs, etc. and then added in the fills with my free-motion foot after. 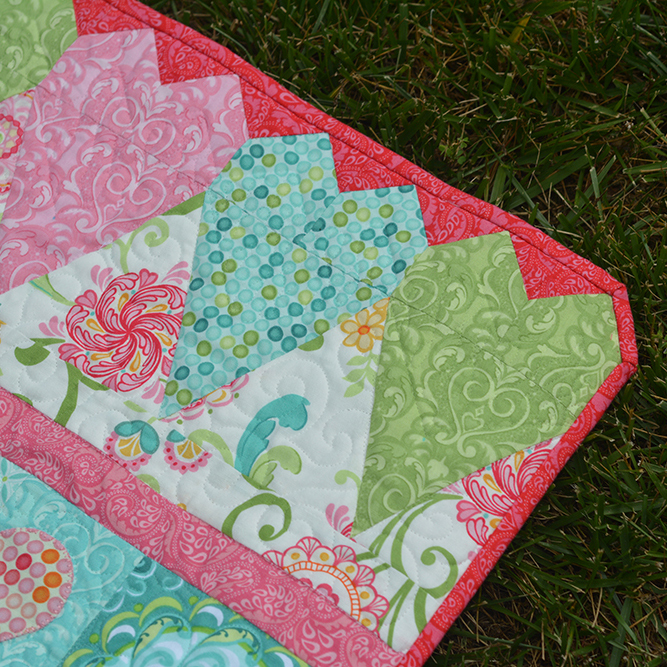 I decided to quilt the central bargello heart by stitching in the ditch on every seam. This really emphasized all of the piecing plus it contrasted nicely with the curving shapes I knew that I going to be adding elsewhere in the piece. Another consideration was that a more wavy design would have been hard to execute cleanly in this area, because even the slightest shifting in the seams would have been noticeable. I used my BERNINA Q Series Ruler Attachment to quilt clean, straight lines. Do you see the diamond border in the lower right hand corner of the above photograph? I choose to bounce from corner to corner of each diamond with a petal shape and fill the interior area with pebbles. Petal shapes are so useful. You can use them in their entirety to create a medallion or a four petal blossom, or you can use just half and bounce from corner to corner of a design. 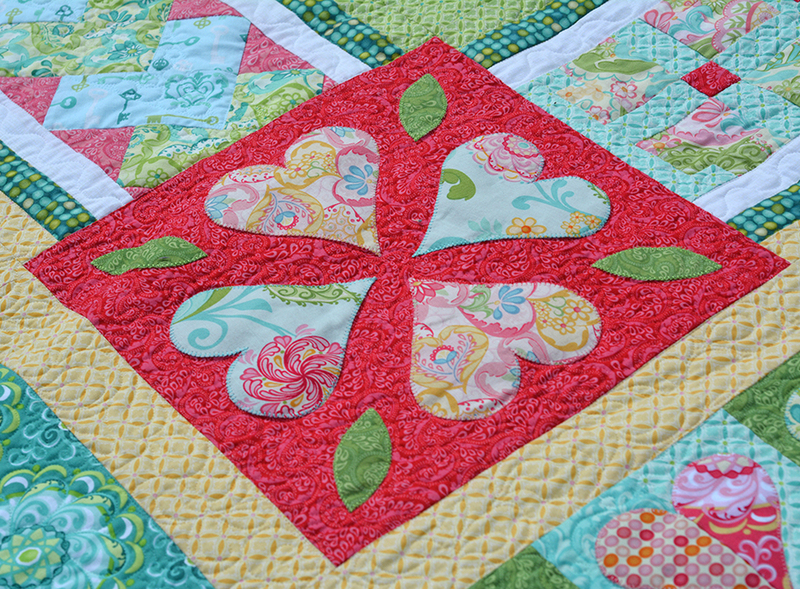 I quilted around each shape in the yellow appliqué border above the bargello heart and then filled in the background small scale paisley design. 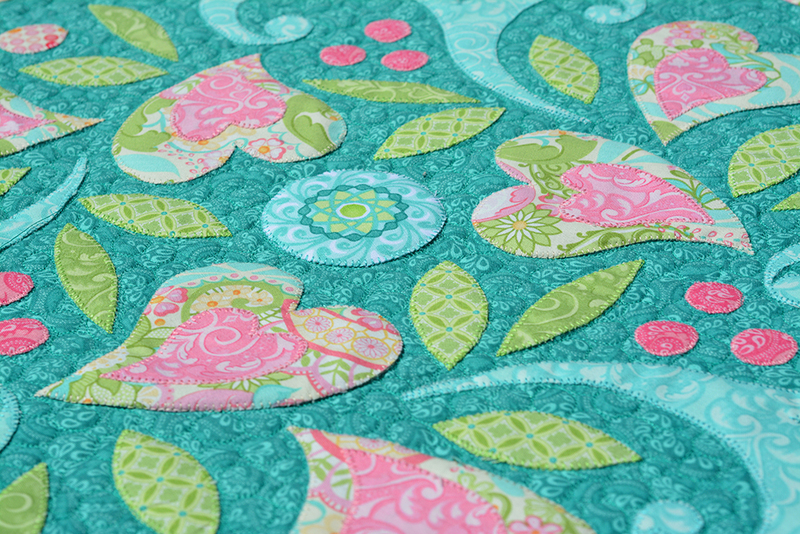 I love paisleys for the back of appliqués – they are really quick to execute and fit well in a variety of spaces. I divided up the hearts in the left border by connecting the two top points of each heart with the bottom point of each. I then filled in the resulting shapes with pebbles. 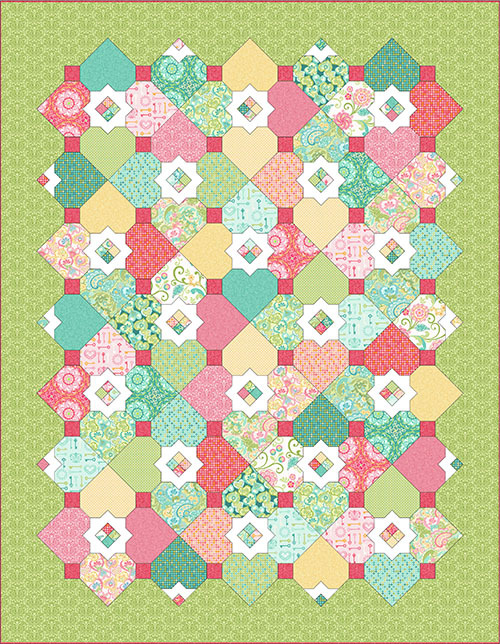 (If you use a fill in one area of the quilt it is nice to repeat the same motif in other areas as well.) 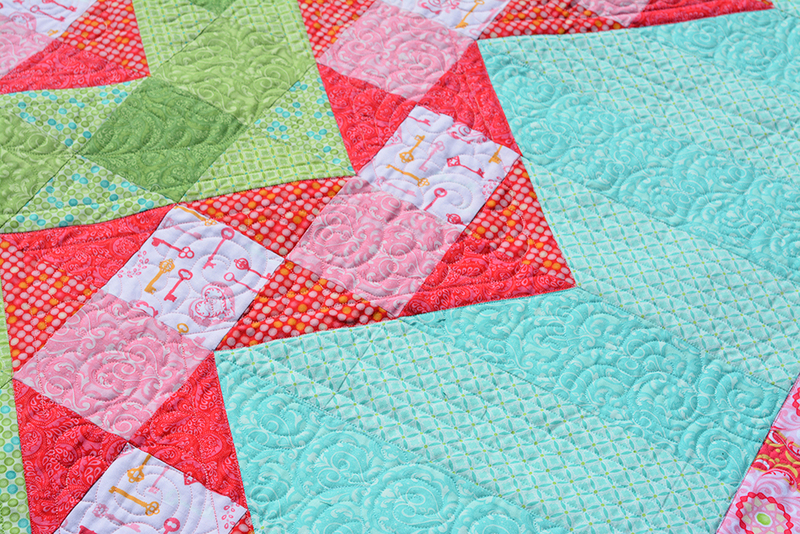 I don’t think that quilting designs have to follow the piecing exactly – sometimes it is more fun to use the piecing as inspiration and add another layer of design during the quilting! You can see just a hint of the bottom central border in upper right of the above photo. 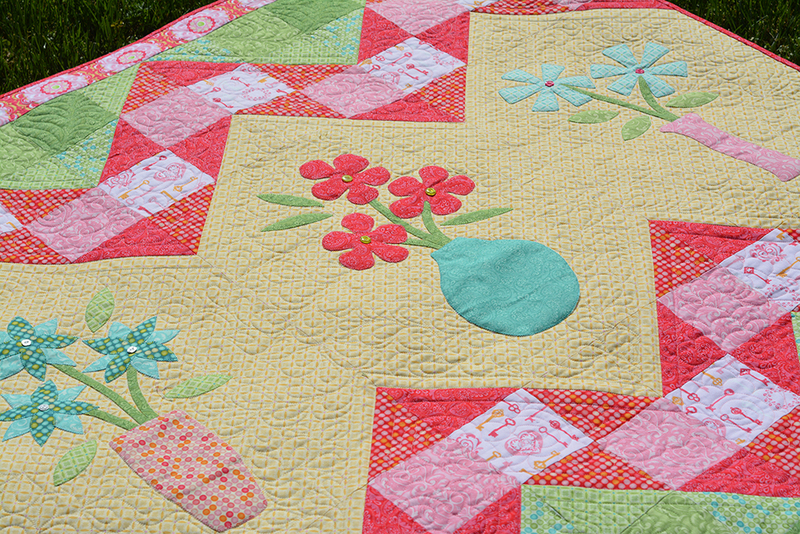 I quilted around each flower and filled in the background with simple ribbons. For the cornerstones, like the pink one in the photo, I simply quilted around each motifs and then did a background fill. 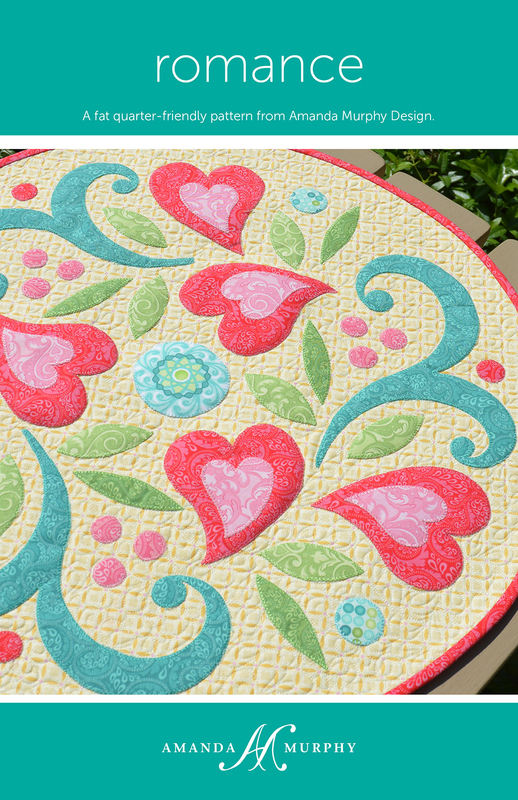 I think I started with hearts, but I couldn’t see anything on the dark pink, so I ended up migrating to a medley of swirls, hearts, and pebbles – or whatever I felt like in the moment that would let the appliqué pop! I figured if I couldn’t see while quilting neither could anyone else. I quilted a medium scale paisleys in the yellow border. What can I say? I REALLY LIKE PAISLEYS! 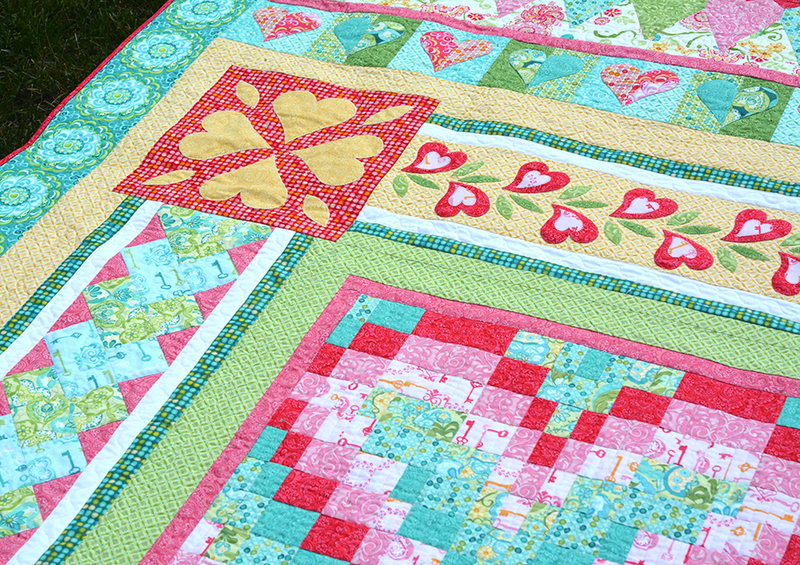 The top and bottom inner heart borders were quilted much like the cornerstones. 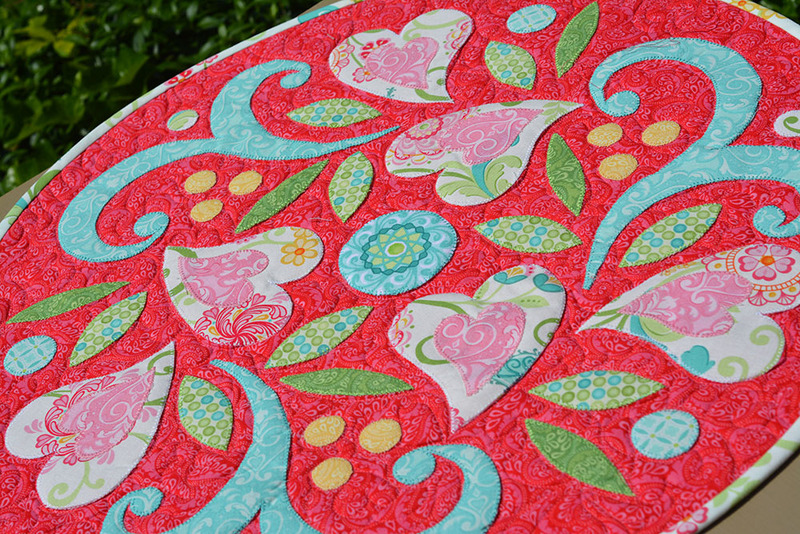 I quilted around each heart shape and filled in the background. 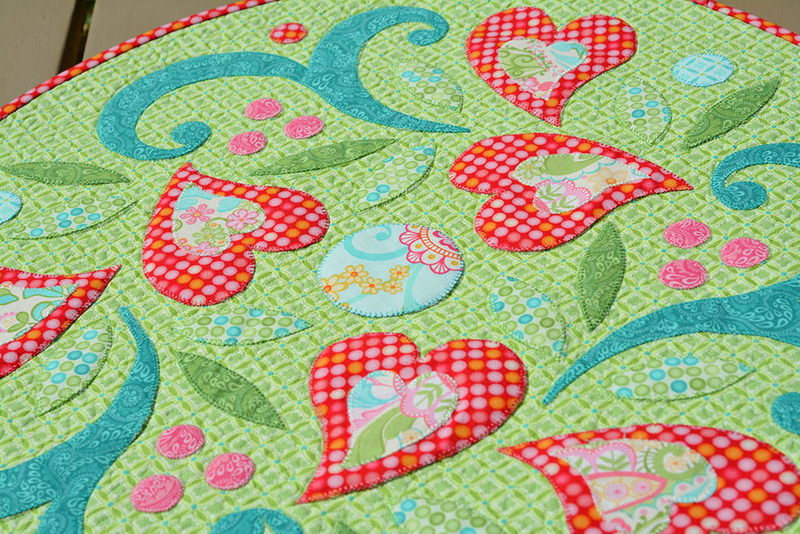 I stabilized the top and bottom outer border, pictured above, by quilting all the way across the top of the hearts and all the way across the bottom of the hearts. I then quilted echoed lines within the hearts, leaving a smaller heart shape. I filled these shapes with a fishbone motif. And I could go right across the quilt without stopping because the motifs were connected and I was using monofilament thread! Finally, I willed in the white floral print area with swirls. Yes, I thought about paisleys because I REALLY LIKE PAISLEYS but I threw caution to the wind and went for swirls instead. 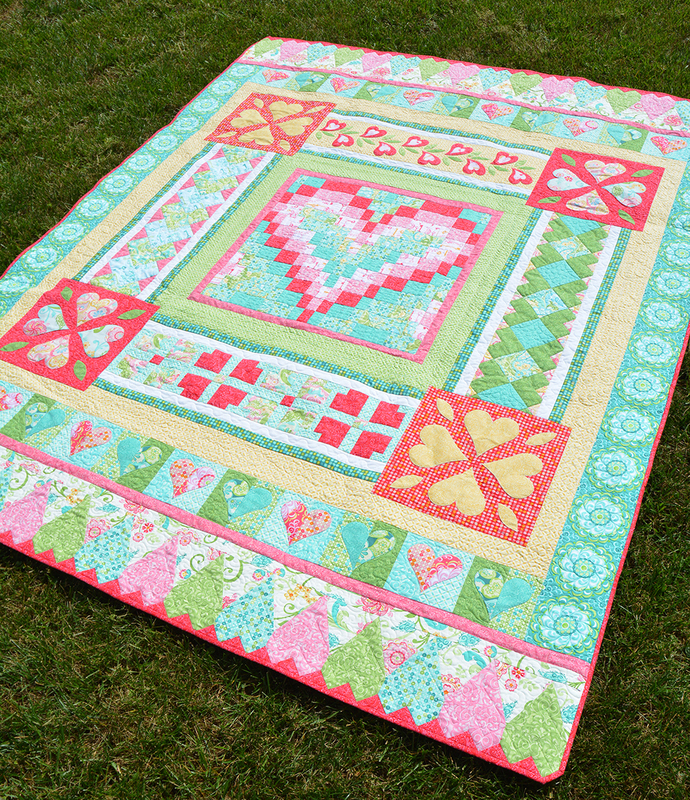 And that is how I quilted Heart’s Delight! 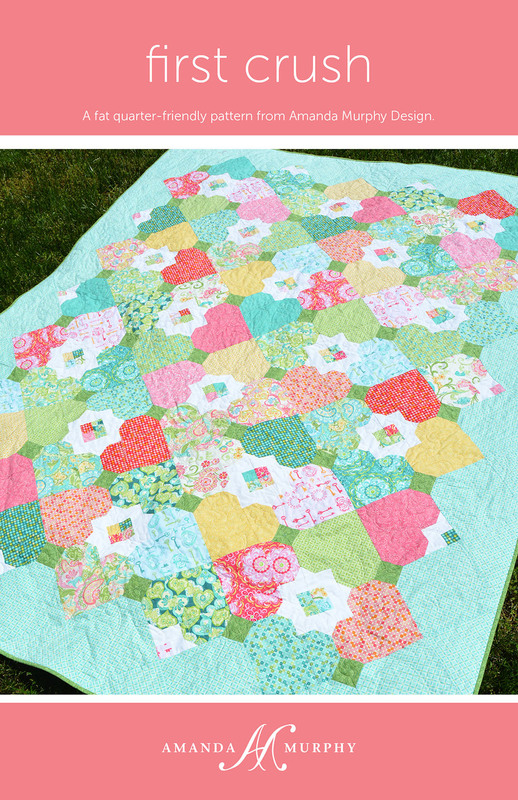 If you are quilting it send me a picture – I’d love to see! 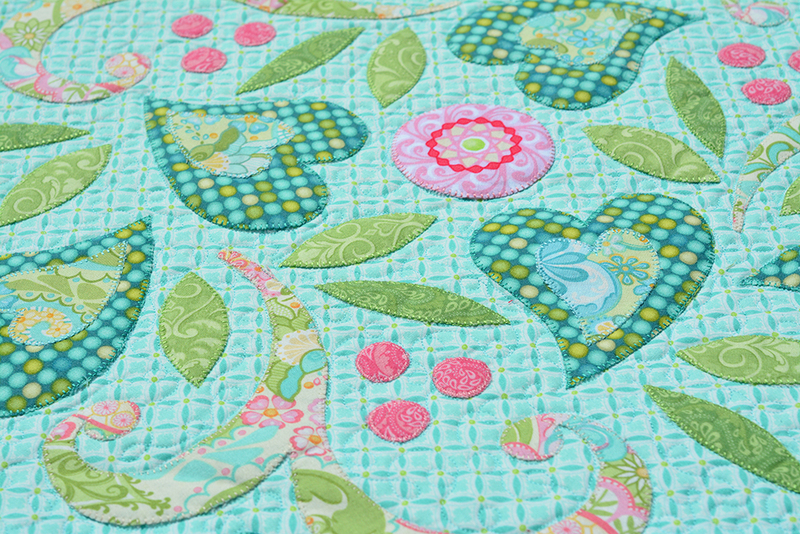 Have a lovely weekend and happy quilting! It seems like I have been waiting for this day – the day I can share new pattern information – forever! They are back from the printer and all the distributor and Market orders have been sent. They are also up over in my shop. 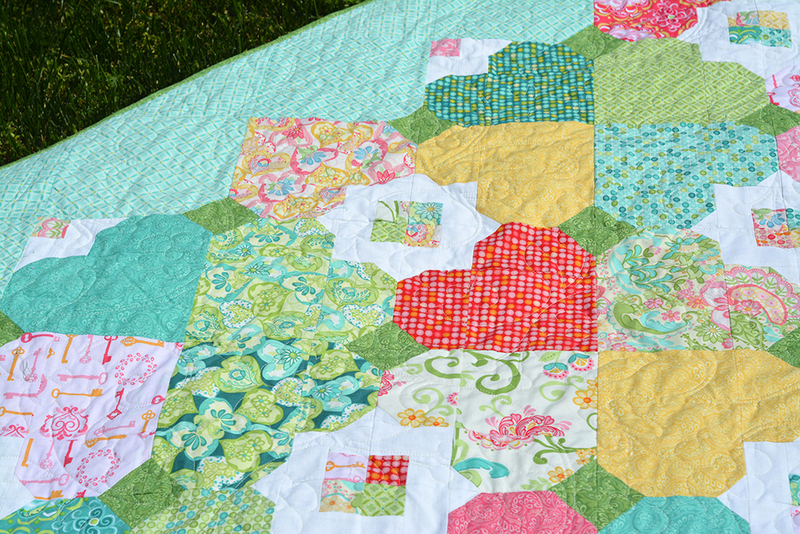 First Crush is a fat-quarter friendly, twin-sized quilt that is actually a deceptively simple quilt made from just one block! The interlocking hearts form a secondary design so it is really fun to watch it come together! 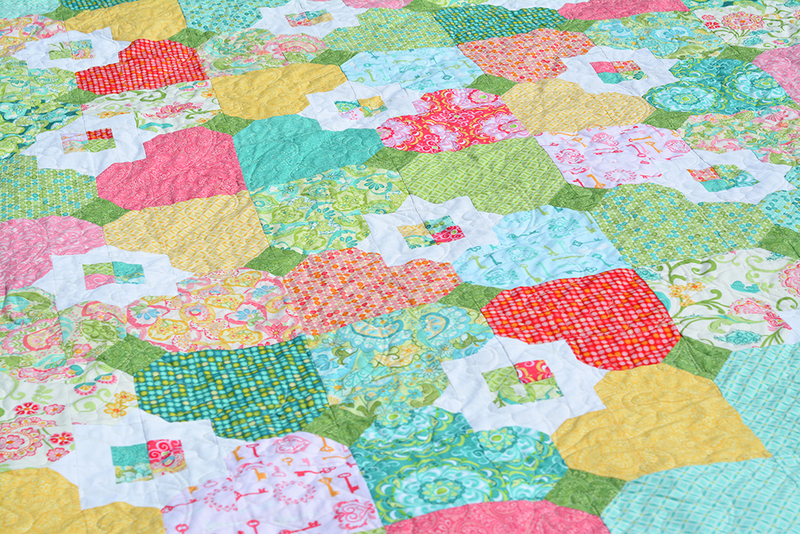 By the way, all these quits feature Carina, my first line for Benartex. I couldn’t be more excited about it and I’ll be blogging more specifically about the fabric when it ships in August/September of this year. 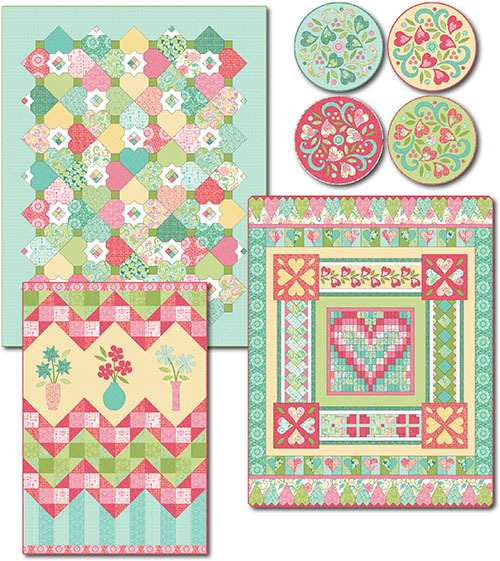 Next up, Bouquet, which is a really graphic lap-sized piece. 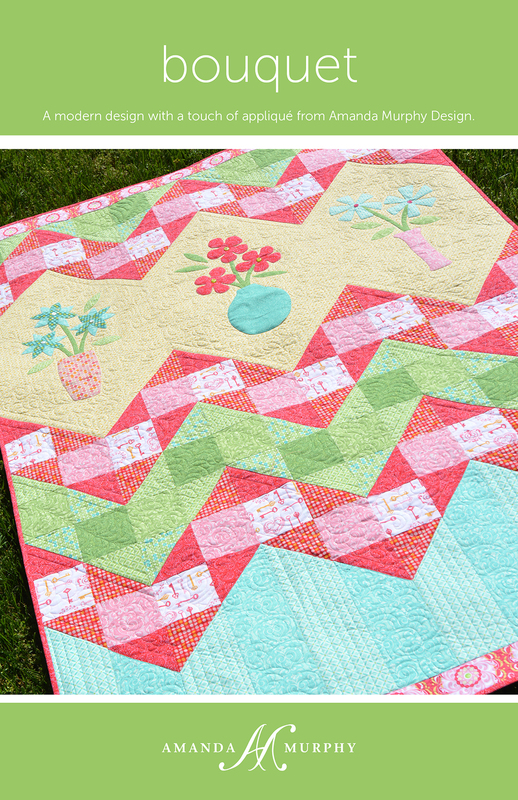 Basically made up of squares, rectangles, and half-square triangles, it is super-easy to piece with just a touch of appliqué. I couldn’t stop making this one – it was fun to play with the colors in the collection. I used 28 wt. 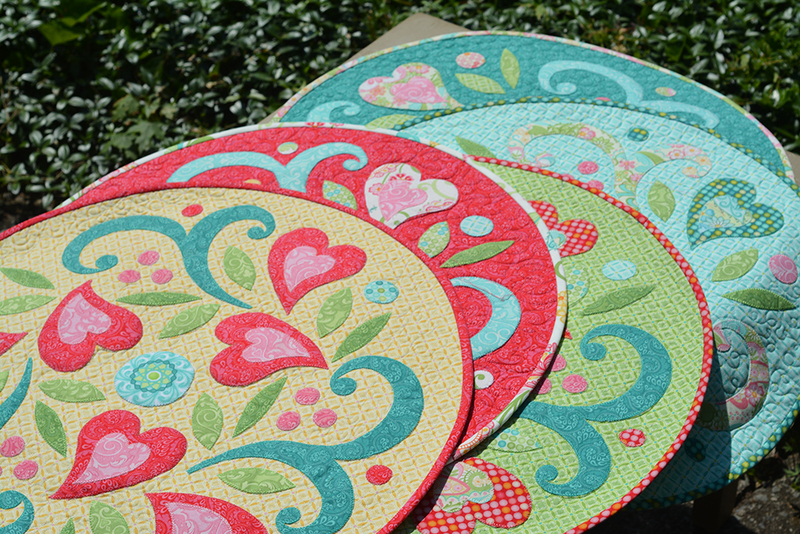 Aurifil thread for the appliqué – my favorite! And last, but not least, is Heart’s Delight. It is my new block-of-the-month style quilt. The pattern itself is chock-full of full color diagrams to guide you. 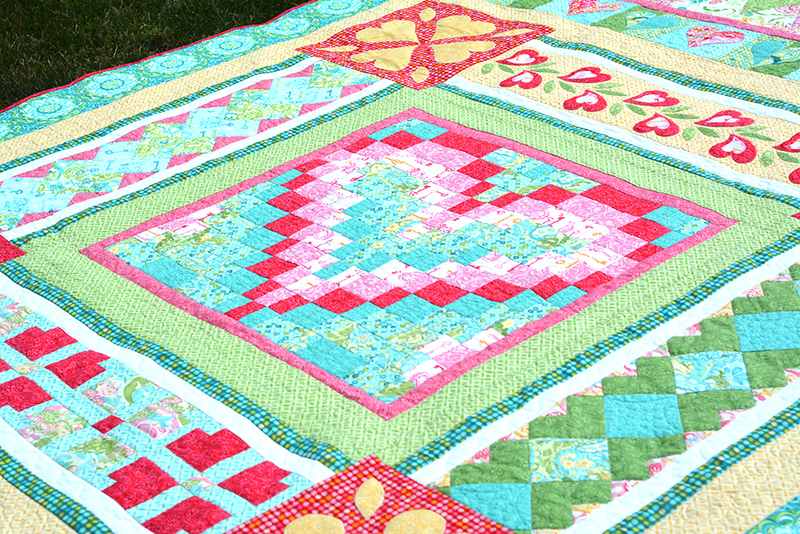 You start in the center with a heart shaped bargello design and work outward, adding borders as you go. 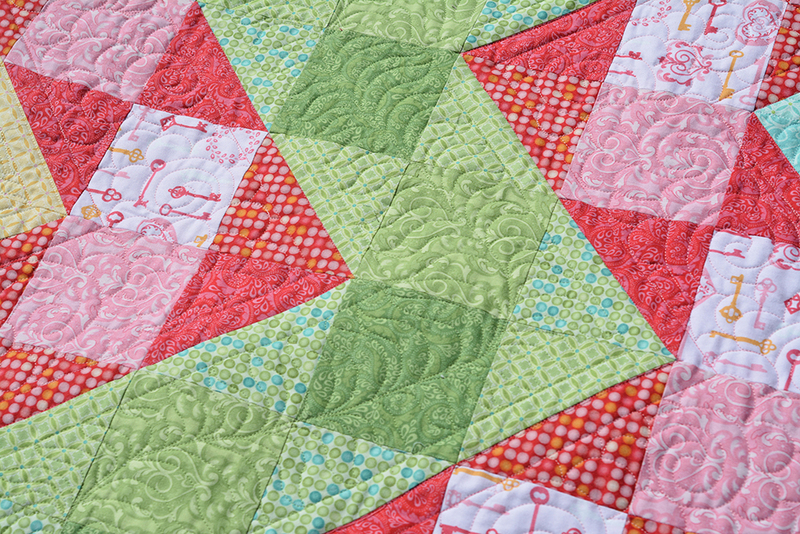 This was also quilted on the Q 24, this time with Aurifil monofilament thread, which was trouble-free. It worked so well and saved a ton of time not having to change colors since I started quilting this two days before Market! Do you like them? I hope so! Do you have a favorite? Also, a popular request has been a discount for a whole group of new patterns so I created something called “The Carina Collection” which includes all four patterns. You can get them at a discount here. 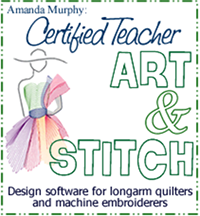 Thanks for reading and I hope you have a wonderful week with lots of sewing!